There are 193 United Nations (UN) member states, while both the Holy See and Palestine have observer state status in the United Nations. However, some countries fulfill the declarative criteria, are recognised by the large majority of other states and are members of the United Nations, but are still included in the list here because one or more other states do not recognise their statehood, due to territorial claims or other conflicts. Some states maintain informal (officially non-diplomatic) relations with states that do not officially recognise them. Taiwan is one such state, as it maintains unofficial relations with many other states through its Economic and Cultural Offices, which allow regular consular services. This allows Taiwan to have economic relations even with states that do not formally recognise it. A total of 56 states, including Germany,  Italy,  the United States,  and the United Kingdom,  maintain some form of unofficial mission in Taiwan. Kosovo,  Artsakh ( Nagorno-Karabakh),  Northern Cyprus,  Abkhazia,  Transnistria,  the Sahrawi Republic,  Somaliland,  and Palestine  also host informal diplomatic missions, and/or maintain special delegations or other informal missions abroad. People's Republic of China 1949 The People's Republic of China (PRC), proclaimed in 1949, is the more widely recognised of the two claimant governments of China, the other being the Republic of China (ROC, also known as Taiwan). The United Nations recognised the ROC as the sole representative of China until 1971, when it decided to give this recognition to the PRC instead (see United Nations General Assembly Resolution 2758). [a] The PRC and ROC do not recognise each other's statehood, and each enforces its own version of the One-China Policy meaning that no state can recognise both of them at the same time. 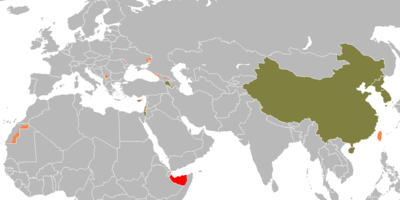 The states that recognise the ROC ( 16 UN members and the Holy See as of 21 August 2018) regard it as the sole legitimate government of China and therefore do not recognise the PRC. Bhutan is the only UN member state that has never explicitly recognised either the PRC or the ROC. The Republic of China considers itself to be the sole legitimate government over all of China (including Taiwan), and therefore claims exclusive sovereignty over all territory controlled by the PRC. Republic of China 1912 [c] The Republic of China (ROC), constitutionally formed in 1912, and located primarily in Taiwan since 1949 (resulting in 'Taiwan' being frequently used to refer to the state), enjoyed majority recognition as the sole government of China until roughly the late 1950s/1960s, when a majority of UN member states started to gradually switch recognition to the People's Republic of China (PRC). The United Nations itself recognised the ROC as the sole representative of China until 1971, when it decided to give this recognition to the PRC instead (see United Nations General Assembly Resolution 2758). [a] The ROC and PRC do not recognise each other's statehood, and each enforces its own version of the One-China Policy meaning that no state can recognise both of them at the same time. The ROC is currently recognised by 16 UN members and the Holy See. Almost all the remaining UN member states, as well as the Cook Islands and Niue, recognise the PRC instead of the ROC and either accept the PRC's territorial claim over Taiwan or take a non-committal position on Taiwan's status. [a] A significant number of PRC-recognising states nonetheless conduct officially non-diplomatic relations with the ROC. Bhutan is the only UN member state that has never explicitly recognised the ROC or the PRC. Since the early nineties, the ROC has sought separate United Nations membership under a variety of names, including 'Taiwan.' The People's Republic of China considers itself to be the sole legitimate government of China (including Taiwan) and therefore claims exclusive sovereignty over all territory controlled by the ROC. Entities considered to be micronations are not included. [d] Even though micronations generally claim to be sovereign and independent, it is often debatable whether a micronation truly controls its claimed territory. [e] For this reason, micronations are usually not considered of geopolitical relevance. For a list of micronations, see list of micronations. ^ a b Israel allows the PNA to execute some functions in the Palestinian territories, depending on special area classification. Israel maintains minimal interference (retaining control of borders: air,  sea beyond internal waters,   land ) in the Gaza strip (its interior and Egypt portion of the land border are under Hamas control), maximum in " Area C" and varying degrees of interference elsewhere. See also Israeli-occupied territories. ^ Israel's Disengagement Plan: Renewing the Peace Process: "Israel will guard the perimeter of the Gaza Strip, continue to control Gaza air space, and continue to patrol the sea off the Gaza coast. ... Israel will continue to maintain its essential military presence to prevent arms smuggling along the border between the Gaza Strip and Egypt ( Philadelphi Route), until the security situation and cooperation with Egypt permit an alternative security arrangement."